Let&apos;s start with an example I screen captured on Chesapeake Bay last May. 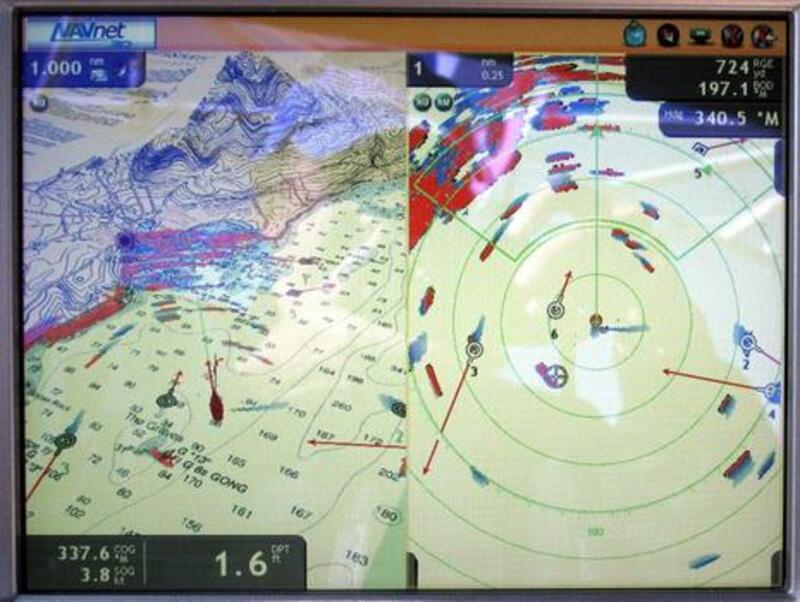 The AIS and MARPA targets seen overlaid on the left side mark the same boat blowing by Gizmo in broad daylight. 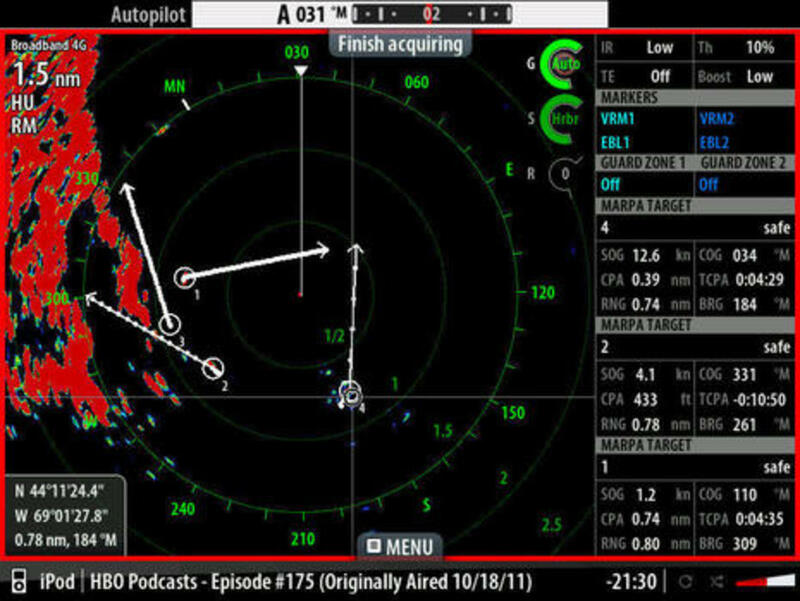 The reason the AIS target is lagging behind the radar target is a known issue with Class B transponders; they only transmit dynamic data every 30 seconds at best, while the radar blip is refreshing every 2.5 to 1.2 seconds (depending on the array&apos;s possible 24 to 48 revolutions per minute). Very soon after this shot, the AIS target jumped to where the radar blip was as the boat steadily planed up the bay. However, the AIS reporting of 256° heading and 18.9kn speed are quite accurate, as they&apos;re coming directly from a GPS on the target boat. Meanwhile, the 12° degree and 7.4 knot errors in the MARPA calculation are actually pretty darn good in my experience. MARPA calculations are really hard! 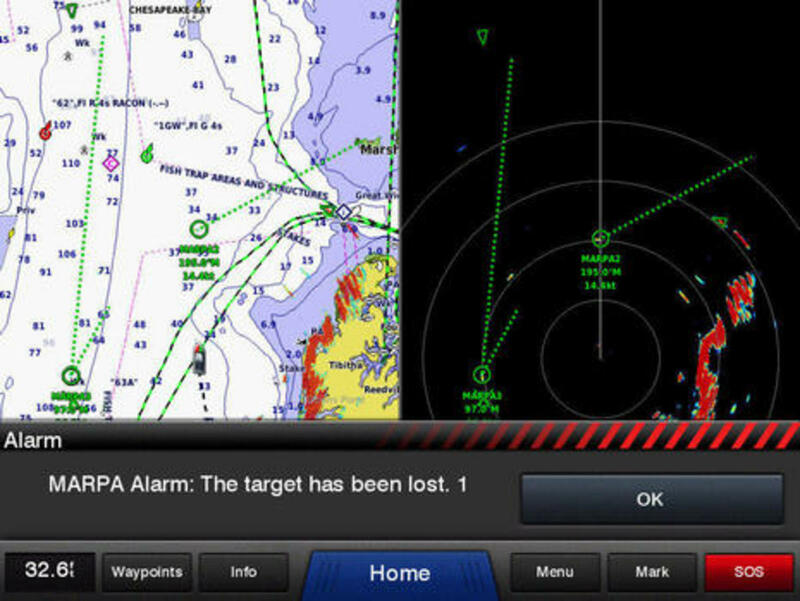 The MFD involved has to compare the range and bearing of successive target returns to calculate its relative speed and heading, and then subtract out your own boat&apos;s motion. 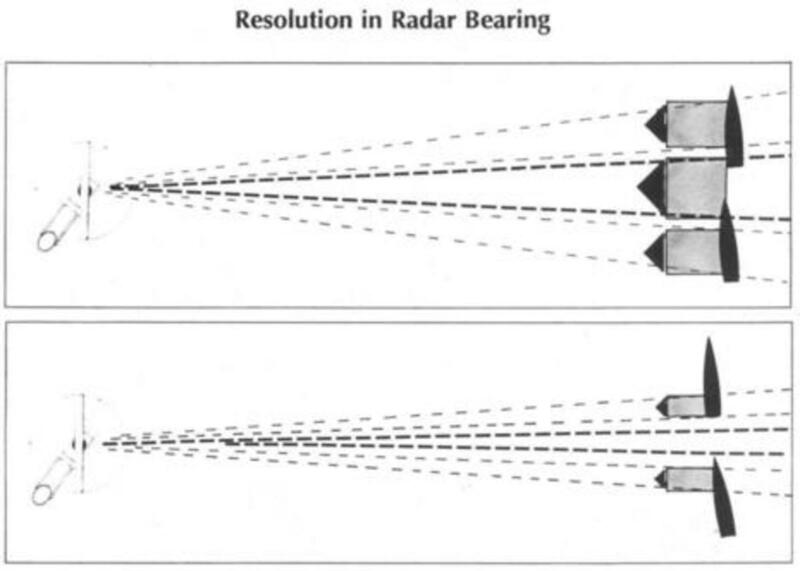 But radars, especially small ones, are quite imprecise at range and bearing. That&apos;s why pulse power and horizontal beam width are primary specifications always listed for radar units and always discussed in radar courses. 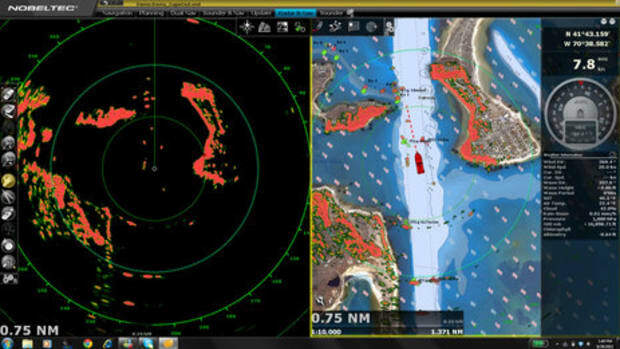 The 5 degree beam width, typical of 18-20 inch radomes like the Simrad 4G and the Raymarine RD418HD behind the MARPA example screens above, means that the raw microwave pulses cannot discriminate detail within a 5° swath, and that swath really is a half mile wide at a 6 mile range. In other words, the individual target bearings used in MARPA calculations are quite crude. Fifteen years ago I used the Ocean Navigator School of Seamanship illustration above to teach how large radar beam widths can even make two targets look like one, and I probably first came across the concept in Chapman&apos;s or something similar in the early 70&apos;s. The uncertainty of radar vision is in my boating bones, and hence I&apos;ve never been surprised to see MARPA true heading and speed calculations jump all over the place, at least until the MFD has had a good long time to compare successive bearing and range guesstimates. 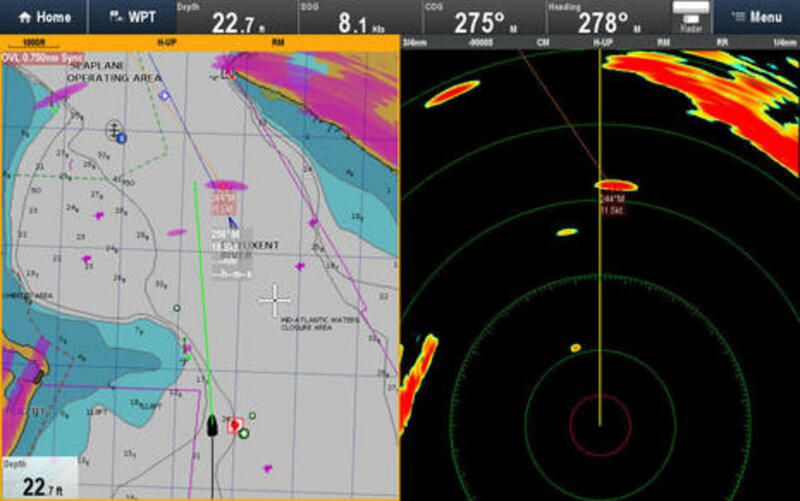 By the way, the 5° beam width applied to the Raymarine 3/4 mile MARPA target above -- online calculator here -- indicates that the radar was trying get precise bearings on the fast 40-foot boat with a beam 400 feet wide. 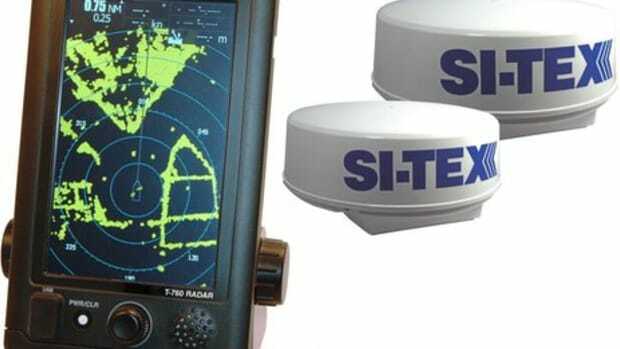 No wonder it got the speed so wrong, and no wonder that I&apos;ve rarely seen small radar MARPA calculate the speed of a fixed navigation aid at 0 knots (though I&apos;ve tried that trick with many radomes). But how many boaters actually use the MARPA they may have? I&apos;m obviously not a big fan myself, and when I searched Panbo for past references it turned out that I used the only MARPA titled entry mostly to discuss attractive alternatives like the True Echo Trail feature seen above emanating from a Furuno DRS2D radome. 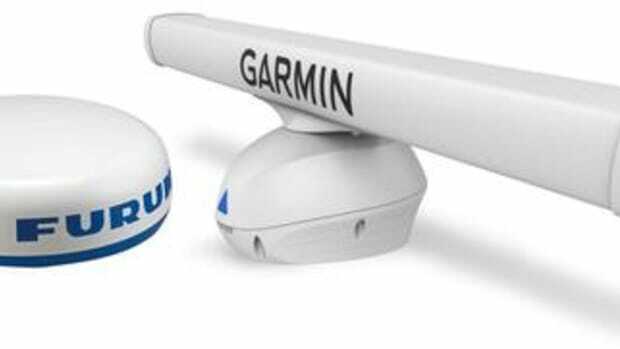 That little radar can even do full-on ARPA, the automatic radar tracking that&apos;s usually only available on ships, but note that Furuno has removed many such advanced features from the similar DRS4W WiFi radome and even the new no-separate-power-supply DRS4DL. 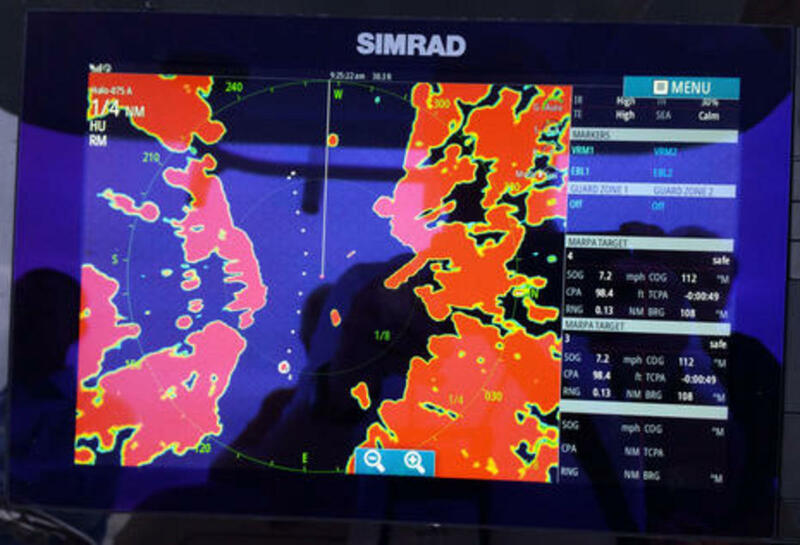 While the prices for these radars is much lower and the user interface much simpler, a Furuno rep at FLIBS also told me that not many recreational boaters use MARPA, ARPA, True Trails, True Motion, high RPM, and similar features, anyway. You could say they&apos;re lazy, but I think that most modern radomes offer a lot of useful information without the extra features, especially combined with AIS and chart overlay. 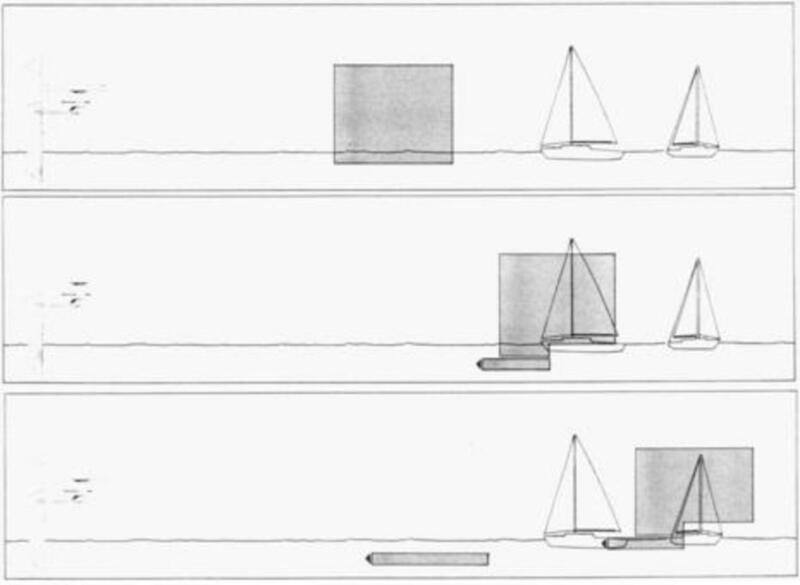 When a yachtsman says that MARPA is critical to safe navigation, I tend to wonder if they&apos;ve been overly influenced by the commercial world where radar beam widths are much narrower and pulses much shorter. In light of this 4G controversy, I do wish I&apos;d tested MARPA more, but I did find some examples when I flipped through the hundreds of screen shots I&apos;ve collected in recent years. 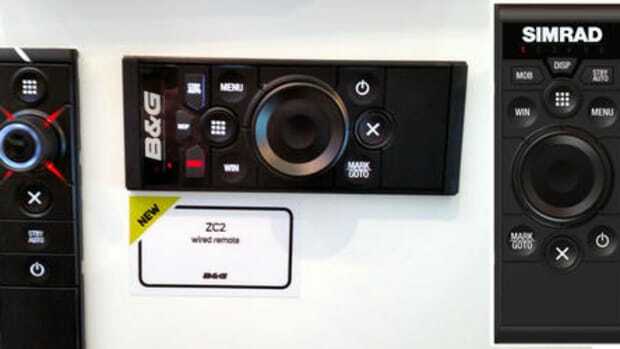 Above, for instance, is Garmin MARPA working with a GMR 24 xHD radome that I&apos;d just installed in Baltimore last fall. 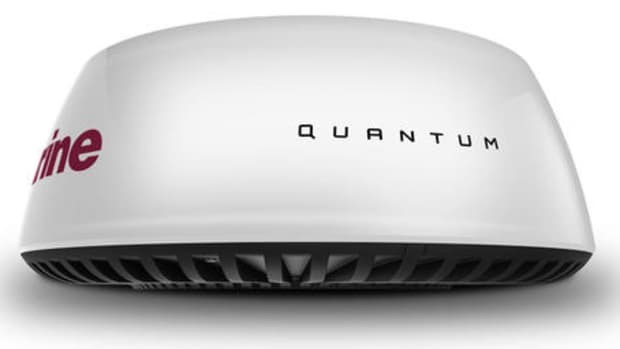 It&apos;s the best performing Garmin radome I&apos;ve tried so far, though often not quite up to what I see on the smaller but similarly priced radomes currently on Gizmo. 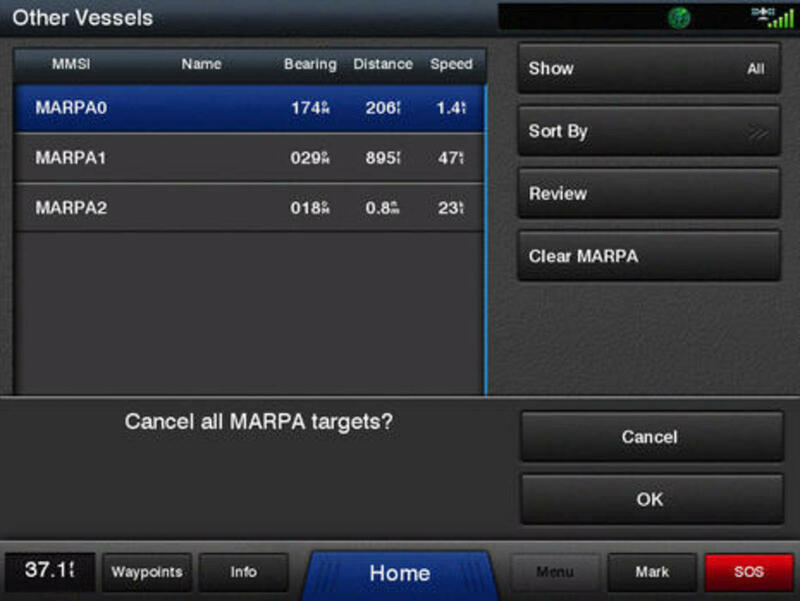 The Marpa calculations were fairly close to what the targets were actually doing -- the 24 does have a 3.7° beam width -- but I took the shot to remind myself that Garmin also has a lost MARPA target alarm you can&apos;t turn off even though almost all such targets go off screen eventually. Raymarine has already heard it directly about their annoying audible alarm, but please, manufacturers, let us users have some say in this. I&apos;d like to reduce MARPA alarms to a simple blinking icon like lost AIS targets, and I think I&apos;d be just as safe. I took this shot to show that Garmin does make it fairly easy to cancel all MARPA targets at once and avoid the alarms, but also to remember that target doing 47 knots while only 800 feet away. If it were close to true I probably wouldn&apos;t have been messing with screen captures. Again, I don&apos;t recall ever seeing small radar MARPA calculations that didn&apos;t get screwy at least occasionally. And the developers can&apos;t just smooth out the results so they look more stable than the underlying range/bearing data. A real change in target heading and/or speed is what you&apos;re hoping MARPA can tell you quickly. Besides, erratic MARPA are meaningful; the MFD is saying something like "I&apos;m trying to figure this out, boss, but it&apos;s hard!" Finally, there&apos;s another aspect of the 4G MARPA problem that I feel obliged to bring up. 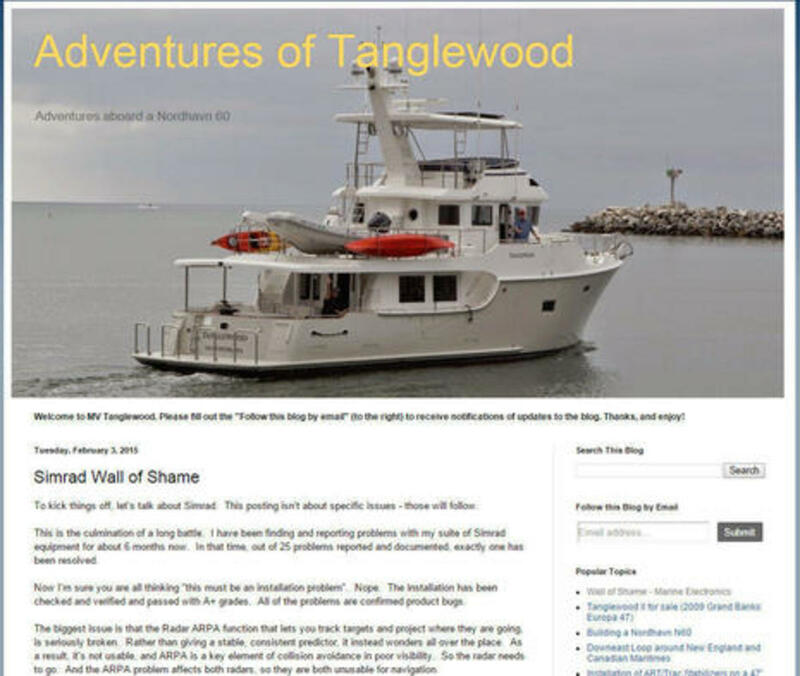 All three 4G owners who complained about it -- one is on the Forum -- referenced the Adventures of Tanglewood blog where Nordhavn owner Peter Hayden has put a lot of time and energy into documenting his bad experience with Simrad gear, MARPA in particular. He eventually tore it all off! I think that Peter may have gotten a little carried away. 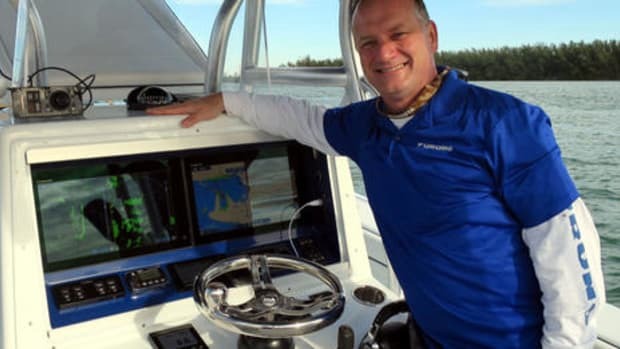 "The very unhappy customer" is a phenomonon fairly common in marine electronics -- perhaps the dark side of how much fun it is for certain smart, accomplished men to dive deep into their boat gear -- and I&apos;ve been there myself. It&apos;s really hard sometimes to see the forest for that one FUBAR tree. 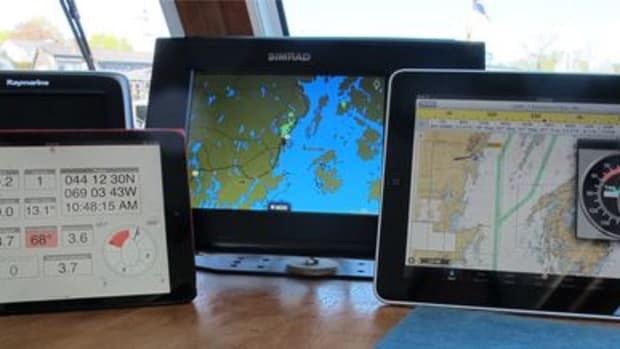 At any rate, I think I&apos;ve read most of Peter&apos;s Wall of Shame and while our overall (Simrad) systems were quite different -- they all are -- he had specific issues that don&apos;t jibe at all with my specific experience. I also tried to straighten out some misinformation in his NMEA rant and you can see for yourself in the comments that it was hard going, with no correction to the entry made. Which is not to say that there isn&apos;t a lot of valuable experience laid out on the Tanglewood blog -- agreed, for instance, that N2K certification is NOT a compatibility guarantee. 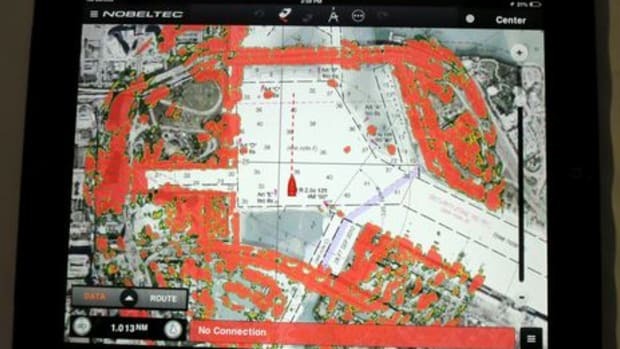 But I need more evidence before thinking of Navico 4G MARPA as "ridiculously broken" and I&apos;m hoping readers will weigh in. 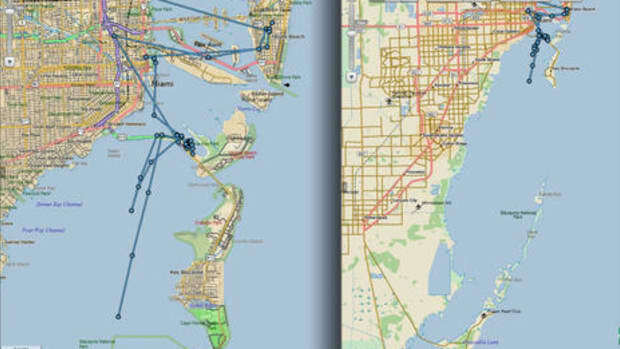 I&apos;ll also get another chance to check out 4G and Halo MARPA when Navico again hosts demos in the Florida Keys. Halo MARPA was first shown during the Baltimore NMEA demos, though only briefly. Looking at my photo below, I like the bread crumb trail, which should be solid information about the target&apos;s past course and pace, and I don&apos;t miss the target vector (an option?). Let&apos;s talk about MARPA and other ways you use radar to avoid surprises.